From the flavor text, it would seem to be a BoP crafted gun- a little odd given that in the past the ranged crafted weapons have been BoE allowing for some AH cash. I really love the way that it changes, in its look, throughout ilvl 630, 645 and to 655! Very neatly done. Ok... so the base version of this gun is a 620ilvl EPIC, and the first upgraded version goes all the way up to a 675 ilvl RARE and the final upgraded version is an ilvl 700 RARE as well..... makes absolutely no sense, lol.... I definitely see some adjustments coming for these guns, at least the 2 higher ilvl versions, because right now the highest version of this gun is a higher ilvl than Mythic weapons and is still a rare instead of an epic... I don't see it staying that way, although I'm sure I'll be downrated by people wishing otherwise Blizzard has never allowed crafted weapons to be more powerful than high-end raiding gear, and I don't see them starting now. I don't understand why this is made BoP. Many enigineers are not hunters, and many hunters are not engineers, as they most likely are leatherworkers with skinning to support it. With all respect, sometimes I honestly don't understand Blizzard's logic... Swords, axes and maces from Blacksmithing are BoE, as goes for the staves from Inscription. why do hunters HAVE to have engineering to be able to have a (near) raid-quality weapon during leveling..? Can be upgraded to 640 item level with a True Iron Trigger[/url. with ilvl 630 and only requiring lvl 91, this will be fantastic for leveling for anyone who didn't get a garrosh heirloom, and honestly this should be better than the heirloom since last I heard garrosh heirlooms don't hit 633 620 til level 100. Curious how upgrading this will work out, seems they havent nailed down final ilvl for the upgrades yet. 1st upgrade seems to bring it to ilvl 640/645 (dif tooltips gun & True Iron Trigger, and the 2nd to 655! If upgrading soulbinds the weapon (doubtful) hunters would seriously want to be engineers (as always). The upgrading components don't appear to be bop, though I imagine they will be expensive early in the expansion. The other mats should be easier to obtain on the AH or from leveling engineering, curious how rare/expensive the Savage Bloods will be. Because all other crafted weapons and armor (outside of cloaks) are under that guideline. If I craft this on an alt and give it to my non-engineering hunter, can I, after I have equipped it, still upgrade it? Crafted items have no secondary stats as crit or haste or mastery... ? Just an observation, but strange that they decided to grade the ilvl 630 version of this weapon as an epic, when all other 630 crafted weapons are of rare quality. I just crafted Eisenschredders Schredder of the Aurora today. +106 haste, +115 versatility. Was super excited just to have the gun for my hunter but I'm going to reroll it. Hoping to get Shredder of the Strategist for the Multistrike and Versatility bonus. Does anybody know if when you re-roll the stats to what you like, when you upgrade it will it retain that stat combination? 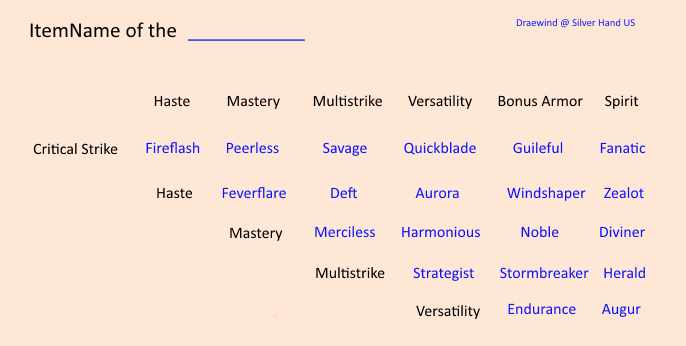 For example, as a survival hunter the optimal stats for me would be multistrike and crit. When I upgrade the weapon from 630 to 640, would it retain those multistrike and crit stats? Or would I have to re-roll it again? This gun can be crafted by anyone. However, people with engineering will be able to create more Getriebefederteile per day and create the gun at a faster pace. The other way to get the parts are through Arbeitsauftrag für Ingenieurskunst in your Garrison. The work order costs you 2x Schwarzfelserz and 2x Echteisenerz and is harvest-able once every four hours. The item is iLvl 630 when you craft it, it is BoE so it can be sent to your alts or sold to other characters. An important thing to remember here is that the required level to equip this item is 91, this counts for all the other crafted warlords items as well. Due to this you can level alts with complete ease and these can be viewed as the new "Heirloom Items" if you may. 3. You apply the Didis kunstvolle Konstruktion to the gun which changes BOTH stats on the gun. 4. Rinse and repeat until you hit your desired stat combo. Side comment: On Argent Dawn the Didis kunstvolle Konstruktion go for 1100-1200g each. As an example: Your gun will be named "Shrediron's Shredder of the Deft" if it has haste and multistrike. In case you are not sure what stat combination you are looking for, then this is the complete list. Does upgrading the weapon cause it to become soulbound? So am I to understand that you can only craft 3 of these? "Unique Equipped: Warlords Crafted (3)"
Let's say I don't have engineering but I do have an engineering works in my garrison. I would be able to create this weapon once my building is level 3. My question is, would I be able to create the True Iron Trigger and Blackrock Rifling to upgrade it or would I need an engineer for that? Is there a chance when crafted to come with a socket slot? The icons for Stage 2 and 3 as shown here on Wowhead look nice, but mine has never changed from the Stage 1 icon in-game. Is this the same for everyone else? Since this weapon has the exact same stats as Primal Gladiator's Rifle, which only takes Conquest Point grinding as compared to the massive gold costs of upgrading Shrediron's Shredder fully, is there any reason to take this, over the Primal Gladiator's Rifle? On my server, Emerald Dream, the cost of Savage Blood just for the upgrade from the 1st form to 2nd form, would cost over 10,000 gold alone. Are there visual upgrades from stage 3 to 4 or is it the same appearance wise? Below are the base and upgraded versions of the gun. This item maintains whatever stats were on the base item when upgraded - the amount of those stats will increase though. 30 X Teufelsfäule Bauplan: Verbesserte Mündungsvertrichterung, sold by the Ore Trader visitor in your garrison - Alexi Hackercam (A) or Trixxy Volt (H). 60 X Teufelsfäule Bauplan: Taladitschlagbolzen, sold by the Ore Trader visitor in your garrison - Alexi Hackercam (A) or Trixxy Volt (H). In case any of you guys are interested, the Ornate Mail transmog set goes very well with this weapon! :) I have submitted a screenshot for it. I just realized that Eisenschredders Schredder 300dps are ridiculously high damage output for level 91-100 and still till 100 raid instances. It's a lot more than my lvl90 heirloom gun/bow like Aufgerüstete zwergische Handkanone, even upgraded to lvl100 (which i won't do now)! And i realized i can craft it to my alt-hunter for leveling, or just buy it for 500g on my server. Can't wait to level him up. Save your money on the Bow/Gun-heirloom and it's heirloom-upgrades (all together around 4k gold!) if you just wanna level your hunter up, buy this pretty overpowered gun and level like a breeze! Are we to assume this was designed by Ketya Eisenschredder? Where in Draenor and from who are upgrade levels 1 & 2 from? If I wanted to reroll my stats of an already upgraded gun would I loose my upgraded stage? As at the moment I'am at Stage 1 of 6. But, my stats are Merciless. I love how this gun starts off very plain, but with upgrades turns into one of the most aesthetically pleasing guns in the game. I xmog everything, but this is one piece for which I can't bear to change the look. Also hangs across the back very nicely. Great job on the model, Blizz. Weird, this has a higher sell price in the legion beta right now (62.67 gold) than on live while all other crafted stuff got its sell price decreased. As of the Legion pre-patch, you have to have these guns in your possession in each three stages to unlock all 3 looks for your wardrobe. As I am an engineer on my hunter I just crafted a new one, and upgraded it once, to unlock the first two 'skins'. You only need to upgrade the gun to stage 3, which requires 2 True Iron Triggers, to get all 3 skins for this weapon. I only upgraded this to level 2 and was granted access to all 3 skins for transmog. I don't know if this is intended or not. "Für Ingenieure ein Kunstwerk. Für Jäger ein Werkzeug für die Kunst des Tötens."